Tech Works Integrated Messaging and Reporting System (IMR) is a Microsoft Windows based Status-Software that provides facility users with a Patient or Room Status tracking system. The IMR is a Sequel Server Based system that acts as a web based server to display the system activity on any product able to display a web browser. That means that any Tablet, Smart Phone, or PC, with access to the IMR network, has access to view the graphics and system status from anywhere at any time. Through password protection users can access and print management reports to monitor productivity and patient activity. 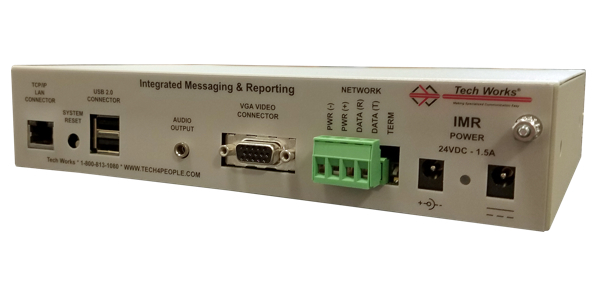 Other types of messaging such as Pocket Paging, or SMS Text Messaging are also available through this system on a point by point basis. Each “Light” can be labeled according to the function or use of the associated point on the system. Groups can be created and labeled to indicate a “Wing”, “Floor”, “Exam Room” or area of a property or building. This product comes preinstalled on a Tech Works PC to operate properly. The initial screen is a status of all the points that the system has recognized. If new points are added the software will identify them and display them intuitively. There are two themes that come shipped with the product List Mode or Group Mode. 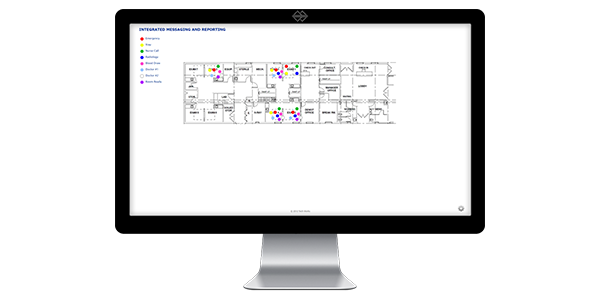 Custom Graphics of your facility Floor Plans are available.